This research project aims to develop a framework and associated tools for fast computation of the space-time reachable sets for multiple networked agents under uncertainty, where agents could be a mix between autonomous robots, semi-autonomous robots, and human-operated systems. 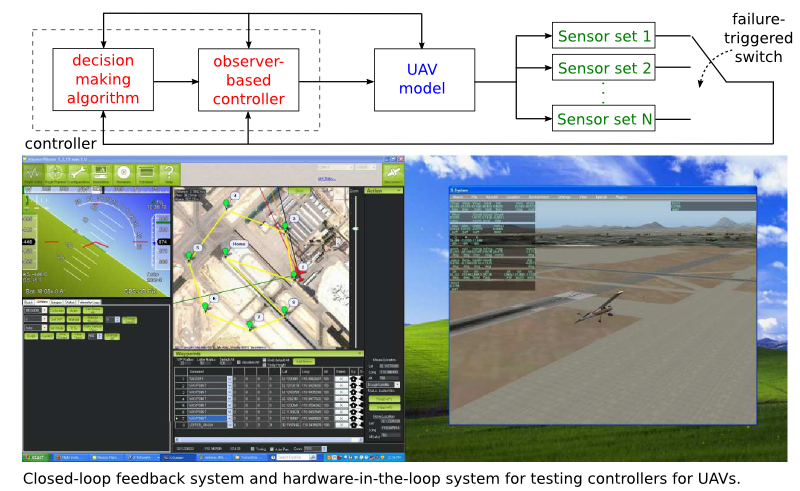 The primary application focus is to guarantee provably safe operation of unmanned aerial systems traffic management (UTM) enabling drones from different enterprises to share the national airspace in real-time, but the methodologies being developed will impact other safety-critical applications, such as self-driving cars, smart grids, and military systems. The goal of this project is to enable real-time computation of the reachable tubes for autonomous, semi-autonomous and remotely human-piloted aerial vehicles in UTM by harnessing two modern developments in computing architecture and algorithms: cloud-based parallel computation, and anytime computation. This proposal presents a research plan to advance the knowledge on the systematic design of algorithms that use prediction and optimization to make distributed decisions in multi-agent systems. Due to the combination of different types of dynamics (continuous and discrete) emerging from the physics laws governing the behavior of the systems, the networks that link them, and their on-board computing systems, the multi-agent systems are modeled as hybrid dynamical systems. The combination of such mixed behavior, both in the system to control and in the algorithms, is embodied in key future networks of multi-agent systems. The future smart grid will have variables that change continuously according to electric circuit laws, exhibit jumps due to controlled switches, failures, and modeling approximations, while the control algorithms require logic to adapt to such abrupt changes. Hybrid behavior will also emerge in other networked multi-agent systems, such as self-driving cars and groups of autonomous aerial vehicles, in particular, due to communication events, abrupt changes in connectivity, and the cyber-physical interaction between agents/robots, their environment, and communication networks. The results from this project will enable the development of such networked multi-agent systems with simultaneous robustness and optimality. Funded by NSF under Grant no. ECS-1710621. PI: R. G. Sanfelice. In this project, building from distributed algorithms for estimation of soft tissues dynamics using differential neural networks (DNN) and the hybrid control strategies, we propose to develop hybrid algorithms for manipulation and grasping tasks involving multiple contacts with soft tissues whose characteristics and dynamical properties need to be identified in real time. The aim of the algorithms to generate in this project is to automatically control the shape of a soft object, whose deformations would lead into active changes in the manipulator’s motion. To date, there are no algorithms that reliably accomplish such a task, and the proposed unique combination of DNN with hybrid control will be instrumental to obtain reliable results. The algorithms resulting from this project will impact to robotic systems for medicine, in particular, robotic surgery, and other applications that impact global economy, such as the active shaping of food materials, handling and folding fabrics, assembling flexible automotive parts, manipulation of cables or sutures, as well as palpating organs and tissues. This proposal aims to generate new tools for the design of decentralized algorithms that make control decisions in a decentralized and robust manner using hybrid control and game theory tools. Game theoretical tools for the solution of differential games allow us to formulate and solve problems that capture individual and collective payoffs as well as the capabilities and effect of each of the agents (or players) participating in the game. On the other hand, hybrid systems theory allow for the modeling and analysis of dynamical systems with intertwined continuous and discrete dynamics. The goal of this project is to formulate hybrid dynamical games that permit modeling, analysis, and design of algorithms for multiple agents with hybrid dynamics. This project addresses security and reliability issues for cloud-connected systems comprising autonomous robots and humans. The scenario is considered where autonomous robots cooperatively perform a complex task, such as search and rescue, intruder detection and tracking, and climate mapping. Robots are connected to the cloud, through which they also receive sporadic and high-level feedback from human operators. Synergy of human cognition and robot capabilities has the potential to enable the completion of tasks that could not be performed by humans and robots alone, provided that appropriate mechanisms are in place to ensure trustworthy cooperation among different parts, and reliable autonomous operation in the face of failures and malicious tampering. This project will undertake the first major steps along this direction by (i) deriving dynamical models of cloud-connected autonomous systems and their vulnerabilities, (ii) designing new tools to ensure security and reliable operation in the face of different attacks, and (iii) demonstrating the effectiveness of the proposed methods to work in practice through simulations and experiments. The objectives of this project are to determine consistency requirements of distributed systems with smart storage devices over realistic networks and design algorithms that assure needed consistency, and to develop an open source software to implement the algorithms in the context of safe operation of autonomous vehicles to provide consistent data. Additionally, an open source hybrid dynamics simulation engine capable of simulating large scale environments with multi-agent systems will be developed. It is believed that future services like unmanned-traffic management will depend upon strong consistency for safe operation. These services will often need to be provided over lossy wireless networks with limited bandwidth, where partitions may be frequent. We propose to study the consistency requirements of distributed systems with smart storage devices over realistic networks. In particular, the distributed systems will implement algorithms that require large amounts of (dynamically changing) data that is available to all systems via a shared log. The problem of navigation of autonomous systems will serve as the prototype application of this research. Funded by National Science Foundation under Grant no. CNS-1544396. PIs: R. G. Sanfelice and J. M. Sprinkle. This project aims to generate new tools for the design of decentralized observers and controllers that not only confer high performance and robustness, but also efficiently handle the presence of continuous and discrete behavior in complex networks. The methods to emerge from the proposed research target communication and control scenarios for Air Force systems in which digital networks define the links between the agents, information is limited, adversarial behavior is at its utmost, and uncertainty is predominant. The algorithms to be developed with the new methods will combine hybrid estimation strategies to identify the behavior of the adversaries with hybrid control strategies for synchronization of multi-agent systems so as to reconfigure and control the agents. The fundamental research in this proposal pertains to the design of hybrid state observers and synchronization algorithms for hybrid systems, which are wide open areas of research. The outcomes of this research effort will permit Air Force’s autonomous systems to satisfy the stringent requirements imposed by its missions, in particular, the accomplishment of a common goal by relying only on noisy and intermittent measurements transmitted over heterogeneous networks. Funded by Air Force Office of Scientific Research under Grant no. FA9550-16-1-0015. PI: R. G. Sanfelice. The increasing necessity of producing more energy, combined with the surging interest in green technologies worldwide, have promoted the need for a highly reliable, cost-efficient, and self-sustained electric power grid. Future energy distribution systems ought to be capable of interconnecting diverse power sources, including fossil and nuclear-fueled generators; renewable sources, such as hydropower generators, photovoltaic arrays, and wind turbines; storage systems, such as fuel cells, compressed-air devices, and flywheels; and power quality improvement units. The purpose of this project is to enable the design of such future smart grid systems using hybrid systems theory. Hybrid systems are dynamical systems with intertwined continuous and discrete behavior. 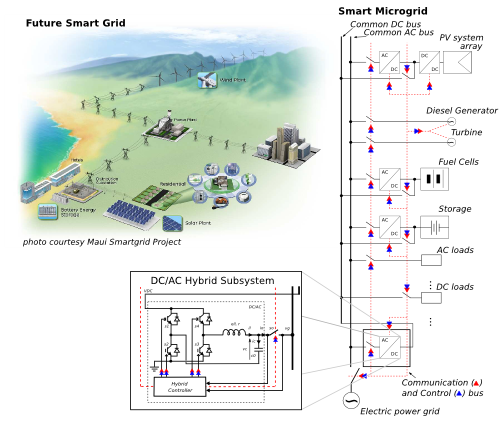 Such a mixed behavior is embodied in models of smart microgrids and their interconnections due to continuous changes as well as jumps in currents and voltages, i.e., mainly due to controlled switches, failures, and modeling approximations. 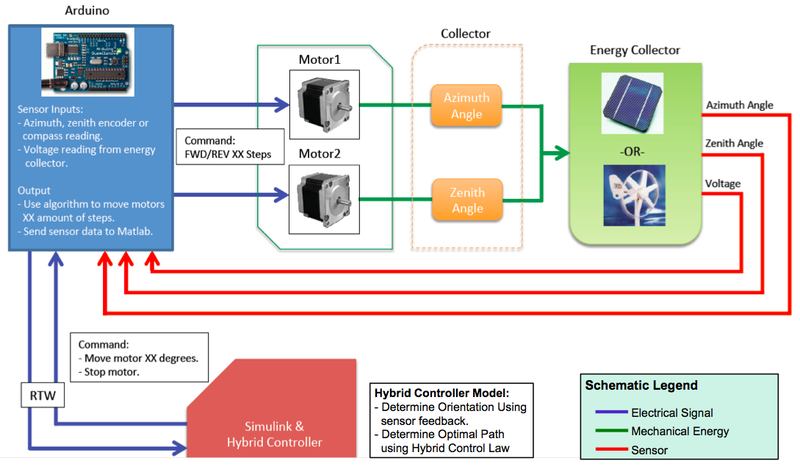 The approach taken in this project is to interpret smart grid systems as the interconnection of hybrid systems with inputs and outputs to facilitate partitioning of the entire system into small, tractable components suitable for modular analysis and design. Such a “divide and conquer” approach relies upon the existence of a theory of interconnections of systems and on constructive control design tools that guarantee robustness and optimality. The goals of this project aim at generating these much needed control and optimization theoretical tools for input/output hybrid system models emerging in smart grids. These new tools will enable modular design of components that operate robustly and optimally when interconnected in real-world smart grids, such as the smart microgrid testbed at Sandia National Laboratories, in which results from this project will be tested. The proposed research plan is deeply integrated with teaching and training activities that will significantly impact middle and high school education levels by training instructors and students on control engineering and applications to smart grids. Funded by National Science Foundation under CAREER Grant no. ECS-1150306. PI: R. G. Sanfelice. To fulfill the stringent requirements of its missions, Air Force combat systems require autonomous systems that are agile, reliable, and resilient. Emerging technologies permitting cooperation of multiple autonomous systems are suitable for the accomplishment of Air Force missions since, rather than relying on a single agent, they leverage task assignment complexity and redundancy by coordinating multiple systems. However, the presence of adversarial elements and uncertainty in the environment impose significant challenges to the design of such systems. In particular, they impose stringent requirements on the coordination and communication algorithms used for the control of multi-agent systems. This project advocates that such requirements can be met by nonlinear state observers and hybrid controllers for multi-agent systems that explicitly take into account the potential presence of adversaries and uncertainty in the environment. To this effect, a control theoretical approach and the combination of state observers and hybrid control tools are pursued for the design of decentralized and robust algorithms for multi-agent systems. The main purpose of using decentralized estimation algorithms is to leverage the presence of multiple agents in the environment to substantially improve the estimation of the adversaries' state by averaging and sharing information. To this effect, design tools for multiple state observers with adaptation to perturbations will be generated. The main purpose of using hybrid control algorithms is due to their suitability in the execution of decision-making strategies for rapid reconfiguration of the agents and stabilization of complex dynamics. The methods to emerge from the results of project target the following communication and control missions for Air Force systems in which adversarial behavior is at its utmost, information is limited, and uncertainty is predominant: beyond line-of-sight (BLOS) communication and control, electronic warfare (EW) in the battlefield, and emergency management in disaster response. Funded by Air Force Office of Scientific Research under Grant no. FA9550-12-1-0366, Young Investigator Program. PI: R. G. Sanfelice. Budget constraints limit the number of sensors that can be integrated in the avionics of Unmanned Aerial Vehicles (UAVs). Sensor failures can prevent avionics from autonomously controlling a UAV and hence, may lead to unstability. Such budget constraints and unexpected failures can be addressed by adaptive/self-configuring avionics for UAVs. The development of such avionic systems require advanced control algorithms executing decision-making strategies designed to cope with a limitation in the number of sensors as well as with abrupt changes of sensor data. In this project, we propose to design algorithms that estimate the state of the system with limited number of measured quantities, perhaps due to cost limitations or failures, and use those estimates to select the appropriate controller to apply to the vehicle. The understanding of the minimum number of sensors needed in control of UAVs and the margins of robustness to sensor failures will provide key insight for the development of fault tolerant, cost-efficient UAVs. Funded by Honeywell. PI: R. G. Sanfelice. Due to their capabilities to reconfigure and adapt to changing environments, spectrum-agile software-defined radios (a.k.a. cognitive radios or CRs) are ubiquitous in a variety of military and commercial applications. These systems provide a much needed solution for improving the spectral efficiency of under-utilized portions of the licensed spectrum as well as to battle adversarial agents attempting to disrupt communication networks. In this project, we consider a novel application of the CR technology for secure satellite communications and apply hybrid control methods to achieve frequency rendezvous of the CRs and to optimize the signal to interference plus noise ratio (SINR) of the network in the presence of adversaries. Funded by AFRL and by AFOSR's STTR Program. PI: M. Krunz, co-PI: R. G. Sanfelice. As renewable energy becomes more widely available, a need for autonomous and standalone systems in remote locations will increase. However, the margins for energy collection are still low; the most efficient solar cells only achieve 40% efficiency. To maximize energy collection, it is necessary to create smart controllers to achieve optimal energy collection and minimize operational power requirements. In this project, we propose to generate a prototype and associated algorithms for control education using Matlab/Simulink based on energy generation from solar and wind sources. It consists of a computer-controlled collector of solar and wind energy sources. The educational integration of this project will be in three control education courses in the Aerospace and Mechanical Engineering Department at the University of Arizona. The introduction of this real-life renewable energy challenge in these courses will provide a practical application to solve using classroom theory. The Pan/Tilt Motion Control System has already been used in projects within the following courses: AME427, AME455, and AME549. Funded by Mathworks. PI: R. G. Sanfelice.